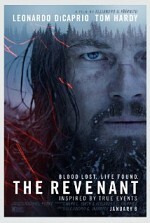 Watch The Revenant: While exploring uncharted wilderness in 1823, legendary frontiersman Hugh Glass sustains injuries from a brutal bear attack. When his hunting team leaves him for dead, Glass must utilize his survival skills to find a way back home while avoiding natives on their own hunt. Grief-stricken and fueled by vengeance, Glass treks through the wintry terrain to track down John Fitzgerald, the former confidant who betrayed and abandoned him.